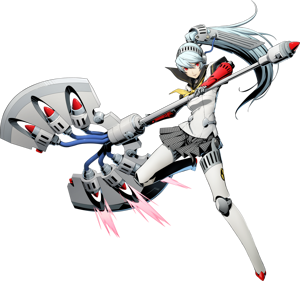 Difference between revisions of "Labrys"
The self-proclaimed student council president of Yasogami High School. Just like Aegis, she's an Anti-Shadow Suppression Weapon in possession of a heart. Her Persona is Ariadne. Swinging around a gigantic axe, her powerful attacks form her distinction. Attacks using her axe will raise her Axe Level, further increasing her offensive power!